Malarone is a safe and effective medication that is used to prevent malaria. It contains the active ingredients Atovaquone (250mg) and Proguanil Hydrochloride (100mg). It is used to prevent malaria in countries where malaria is common. What is the difference between Malarone and the generic tablets? Malarone and its generic counterpart both contain the same active ingredients (Atovaquone 250mg and Proguanil 100mg). This is the main ingredient that is used to prevent Malaria, and any differences may be within the inactive ingredients (such as the substances used to bind the tablet together etc). They both work in exactly the same way to prevent malaria. The two ingredients present in Malarone (Atovaquone and Proguanil) work together to interfere with the growth of the malarial parasites that have entered the body, stopping them from reproducing and replicating. When used in conjunction with other preventative measures, Malarone is considered to be more than 90% effective. It is important to note that whilst Malarone is one of the most effective anti-malaria tablets available, no antimalarials can guarantee 100% protection. 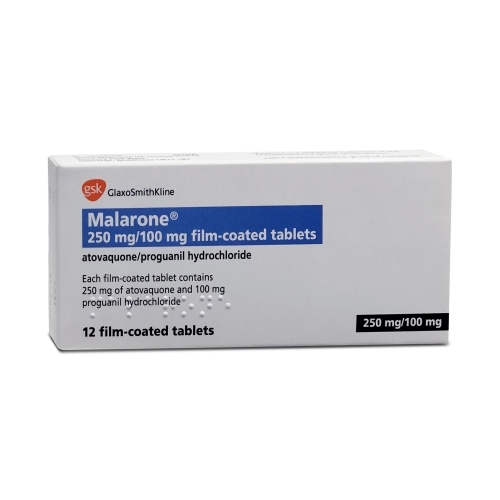 Malarone should be taken 1-2 days before entering the malarial area, whilst in the malarial area and for seven days after leaving the malarial area. It should be taken once at the same time each day, preferably with food or a milky drink, as it helps to absorb the tablet more effectively whilst helping to reduce any gastrointestinal (stomach related) side-effects. It is important to remember to continue to take Malarone for seven days after having left the malaria zone, as this will ensure to kill any parasites that may be present in your body, stopping you from getting malaria. What if I forget to take a dose of Malarone? Take the dose as soon as you remember if it is on the same day. If you do not remember till the following day, leave out that dose and continue to take your tablets at your usual time. Do not take two tablets together. Does Malarone make you feel sick? A relatively common side-effect of Malarone is nausea. Whilst most people are not affected by this, a few people may find themselves feeling slightly sick after taking a tablet. Sickness with Malarone can be minimized by taking a tablet with a meal that is rich in carbohydrates, in order to line the stomach. What happens if I vomit after taking Malarone? If you vomit within the space of an hour after having taken Malarone, you should take another tablet. You should inform us that this has happened, and we can arrange to send you a replacement tablet. Why does Malarone have to be taken for 7 days after having left the malaria zone? Even after you have left the country where malaria is present, you are still at risk of developing malaria. This is because there may be parasites in your body from an infected mosquito bite that you received whilst abroad. 7 days of treatment is required in order to kill these parasites to prevent them from replicating and causing malaria. If you stop taking anti malaria tablets before the prescribed course is over, you run the risk of developing malaria. When is Malarone not suitable? You should not take Malarone if you are allergic to any of the ingredients present in the tablet, or you have kidney problems. You should speak to your GP about different anti malaria tablets that are safe for you to take. Unless absolutely necessary, pregnant women should try to avoid destinations where there is malaria. This is because pregnant women have a high risk of developing malaria that is more severe in comparison to non-pregnant women. Malaria can also cause complications to do with pregnancy such as miscarriage, stillbirth or premature labour. Malaria can also affect the normal growth of the foetus. If travel to areas where malaria is present cannot be avoided, you should seek medical advice from your doctor in regards to which malaria tablets to take. Your doctor will decide whether the benefits of taking antimalarials outweigh the risks, taking into consideration how far you are into your pregnancy. You should postpone trying to pregnant until after you have finished your course of Malarone. If you discover that you are pregnant whilst taking Malarone, you should consult your doctor. Is Malarone safe in breastfeeding? Malarone is not considered to be safe in those that are breastfeeding and should be avoided. You should speak to your doctor about which malaria tablets are most suitable for you to take. Can I take Malarone if I am taking other medication? This is because Malarone may affect the way these medicines work in the body. You should let your doctor know if you are pregnant. This includes before starting a course of tablets, and also if you have discovered that you are pregnant whilst taking tablets. You should also inform your doctor if you have missed a number of doses. This could be because you have forgotten, or due to side-effects that you are unable to tolerate. If you are experiencing any serious side-effects of Malarone, such as difficulty breathing or swelling, you should seek immediate medical attention. There is no interaction between Malarone and alcohol, and you can drink whilst taking these tablets. Malarone tablets are too big for me to swallow, what should I do? You can crush tablets and sprinkle them over food. To avoid wasting any of the tablet, you can place one in a small plastic bag and crush it. Is branded Malarone better than the generic version? Many medicines on the market are now available as a non-branded version, which is usually cheaper. The manufactures of Malarone had a license to be the sole producers of this particular type of medication, and when that license ran out, other drug manufactures were free to produce the same tablet, in a non-branded form. Both tablets contain exactly the same active ingredients, and work in the same way to protect against malaria. Due to the nature of this type of medication, it is important that you are screened so that we can determine whether the medication is safe for you to take or not. Can I get Malarone on the NHS? It’s uncommon to receive travel medication on an NHS prescription. Travel is seen as a luxury, which is why Malarone is not available on the NHS. Exemptions to the rule are those with certain medical conditions, and those who live in areas where a large percentage of the local population have returned from malarious areas with malaria. To find out if you are eligible for malaria tablets on an NHS prescription, you should ask your GP. Can I buy Malarone online for other people? The medical questionnaire is designed to asses each patient individually, in the same way your doctor or pharmacist would carry out a consultation. In the best interests and safety of our patients, we require each individual to fill out a questionnaire themselves. How can I buy Malarone online? You can buy Malarone online in 3 easy steps. Choose the number of tablets required, fill out a medical consultation and checkout. Your medication is dispatched from our pharmacy and will be delivered to you the next day. Whilst most first class mail arrives the next day, a guarantee is not provided, and if you have left getting your anti-malaria tablets till the last minute, we suggest using a next day guarantee delivery option. We source all medication from reputable and leading UK pharmaceutical wholesalers, ensuring that all of our patients receive high quality medicine.